Martin Freeman hosted Saturday Night Live last night and revisited two of his most beloved roles, Tim Canterbury in BBC’s The Office, and Bilbo Baggins in The Hobbit. 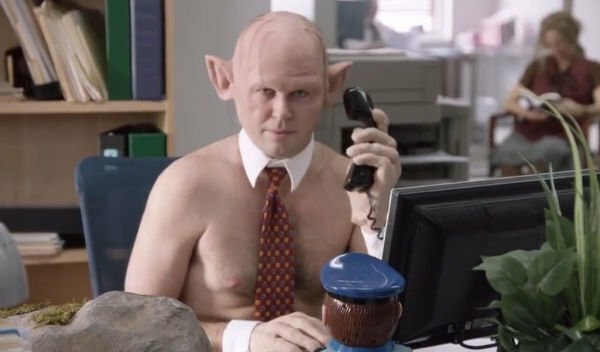 Watch the hilarious sketch as Bilbo Baggins takes on his most terrifying journey yet, a day at The Office. The sketch entitled, "The Office: Middle Earth" starts out with a disappointed Bilbo Baggins explaining what he’s been up to for the past few years, including saving Middle Earth, becoming a hero, cashing in some treasure, and now, after all he’s accomplished, he’s stuck working at a paper company and drives a Jetta. The look on Freeman’s face after that line says it all. He just bites his lip, looks side to side in that classic Tim Canterbury annoyed yet playful manner that we all came to love. The skit is the perfect mash-up between the two worlds. There’s the ridiculous general manager position, taken over by Gandalf, but within the style of Ricky Gervais’ goofy and inappropriate character David Brent. There are elves, dwarves, orcs, and by the end of it even some giant spiders to battle in the parking lot. But, arguably best of all, is that Gollum plays the Gareth Keenan (Mackenzie Crook) role. It’s fantastic. The skit starts with a call back to the first episode of The Office when Gareth finds his stapler inside Jell-O. This time though, it’s Gollum losing something so precious to him, so we find the ring in the same type of Jell-O mold that the stapler was found in the original show. Just brilliant. Later in the skit, holiday festivities commence, and we have the pleasure of witnessing Gandalf do the uncomfortably awesome David Brent dance. The room goes silent. Then the camera cuts to Freeman stating, "Uh, well you don’t choose the people you work with… or go on a quest with." This was Freeman’s first time hosting SNL and he often joked throughout the show of being relatively unknown in the United States. But he has quite the résumé beyond The Hobbit and The Office. He was in the holiday classic, Love Actually plays Dr. John Watson in BBC’s Sherlock, is in Fargo and more. You can see Freeman one last time as Bilbo Baggins in the final film of the trilogy, The Hobbit: Battle of Five Armies, in theaters now.